There is more to boating safety than buying-registering-and insuring the boat. Purchasing the gear for whatever activity you like best, making sure life jackets fit everyone, and making sure there are plenty of snacks and sodas. All those things are important, absolutely. But there is still more to boating. If you have been night boating, you know how important it is to know what the lights and the colors of the lights on your boat refers to and even during the daytime hours – how dangerous it is to NOT know the rules. For instance, you are cruising along in the dark, enjoying the hum of the engine as the only sounds you hear, the air has cooled and your boat mates and you are tired from a great day of boating. And you see a green and a red light obviously on a boat. What are you looking at? You are looking at a boat potentially heading straight for you. That is right. Because the green light is on the starboard(right) side of your boat, the red is the port(left). So, if you see them both then there is a chance you are looking down the nose of a boat. What is the first thing you do? Well, it is the preferred method to pass on the port (left) side. So, one blast of the horn tells the other boat you are intending to pass on your port side, and then the other boat should do one blast back to affirm they understand the plan that the two of you will be passing on the port side. 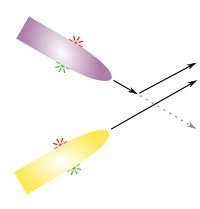 Two blasts from both means you will be passing on the starboard side. Men who work on the barges will say, ” one whistle side, or two whistle side,” when referring to which side they are passing, the port or starboard. The rules of the road, navigational rules, state that no boat has official “right of way,” but what is expected is to navigate away from a potential collision. How do you determine who, if anyone, has the “right of way” if two vessels are heading in to a collision and how in the world does the operator react? 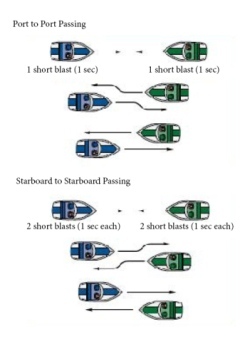 Okay, so if you are operating a boat and you see another boat off your starboard (right) side, you are considered the “give way” vessel. Which means you are the boat that gives right-of-way to the other boat and move to avoid a collision. If it is night, and you see the red light on a boat, which indicates you are looking at their port(left) you must also react. On the other hand, if you are a vessel and you see another vessel to your port(left) side, you are the “stand on” vessel. Which means you are to continue in your same path. Same at night, if you see the green light, which is on the starboard(right) side of a boat, they SHOULD know it is up to them to move. However, the bottom line is to avoid a collision. Even if you are on the boat considered the “stand on” if for whatever reason the “give way” vessel is not “giving way,” it is up to you to avoid the collision, then do so. As you can tell, boating requires a lot of attention to be paid to your surroundings and even more so at night. All too often, operators are not paying attention or worse, they do not know what to look for and what those colored lights mean to begin with. Meaning they have not learned the “Rules of the Road,” and are making the water less safe for anyone. Just more reasons to – take a Boating Safety Course and have boat insurance – before taking those you care about out on the water. 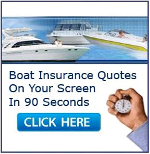 Boat insurance is like life insurance!! My boat is my life! Dont know what i would do without it.